There are some things that just aren't easy for both the buyer and the seller on eBay and one of them is definitely getting a new total to the buyer. There are many reasons to vary from the listed eBay price - perhaps to offer a discount, combine the shipping fees, maybe the item will be customized or your Aunt Fran wants one and you don't want to charge her full price. The BUYER must do all the work BEFORE paying for the item and the SELLER must do the work after the sale (paid or unpaid). There are two scenarios below: buying 1 item and buying more than 1 item. BUYER: There are a couple scenarios. You want to buy one item. You want to buy more than one item and you either already committed to buy something or you have the items in your cart. This will open up a new window with a simple text box. Just type what it is you want "hey, it's me and we talked about a 10% discount" and send it. From there the seller will get the request and respond with an "invoice" which will have a new total for you to pay. 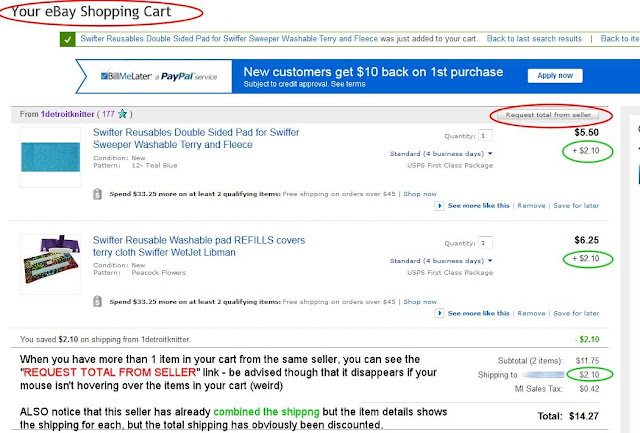 I WANT TO BUY MORE THAN ONE ITEM: Maybe you bought an item then decided to buy another item from the same seller OR you could have two items in your cart that you want to buy from the same seller. In either case and for what ever reason (combined shipping, multiple discount, friend of the family) you can "request a total from seller". Now in order to submit the request you must "commit to buy" the items. DON'T PAY FOR ALL THE ITEMS YET!! The new total request form is the same for 1 item as it is for 2 or more, just type in your message and send it. From there the seller will get the request and respond with an "invoice" which will have a new total for you to pay. 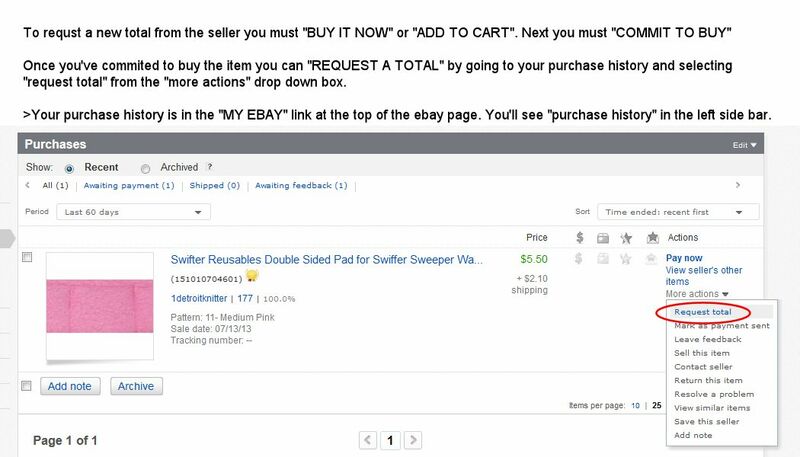 SELLER: Before the buyer pays he can send you a "request total" - use the information above if you aren't sure what to tell the buyer to do. 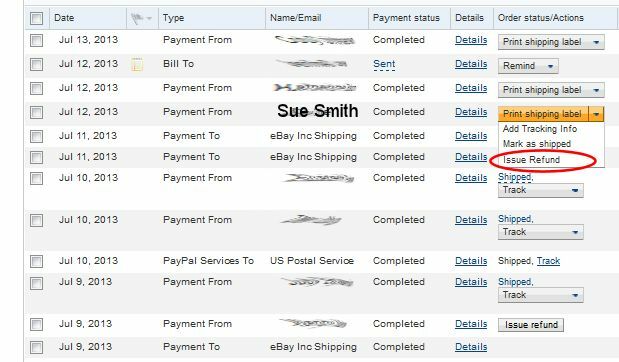 After the buyer creates the request, you will get a notification of the request with a send invoice/reply button. Click on the button and it will open up a window that will allow you to enter new totals for the item(s) and shipping. After the buyer has paid all you can do is issue a refund. Most likely the buyer paid with PayPal. Log on to your PayPal account. You should now be on Your Account page with your account activity. Find the transaction and use the drop down box to select "issue refund". Sometimes (after a few days or once you've shipped perhaps) the drop down box disappears and you might see the issue refund link right there and other times you may need to hit "details" and in the middle of the page you will see an "issue refund" link. If more than 60 days have passed, you will not be able to issue a refund this way. 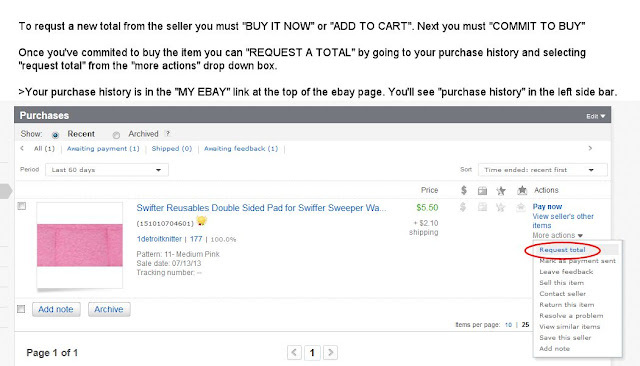 You can of course send the buyer money using the "send money" tab at the top of the page. 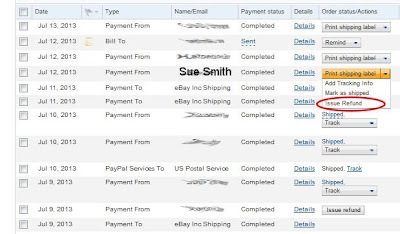 Sample of PayPal "Issue Refund"
Yep, that's it in a nutshell. Hopefully this answered a few questions! I have no idea why ebay is so adamant on this; people change their minds online and in brick and mortar stores so this "contract" to buy is kind of dumb if you ask me.